Is there anybody who doesn't, at least a little bit, long to look up and see a sky filled with languid, elegant zeppelins and blimps and airships silently crisscrossing overhead? That always seems to be a hallmark of some amazing future that never quite happened. Luckily, it seems like I'm not the only one having these daydreams. My old pal the US Military has been having them, too. And, say what you will about good old US Military — sure, sometimes they're a pretty mean drunk, but when old US Millie sets their mind to something, it gets done. This time, what's been gotten done is the first successful test flight of a new lighter-than air craft: the Aeroscraft heavy-lift airship. Sure, the test was just the craft hovering a dozen or so feet off the ground inside the hangar, but even that modest test "put a little dot in the line of aviation history," according to flight control engineer Munir Jojo-Verge. The airship (called Dragon Dream, which is probably better left unexplored) is 230 ft long and utilizes both aerodynamic and aerostatic principles to stay aloft. Unlike past blimps or dirigibles, the Aeroscraft uses helium for only 2/3 of its lift, with the rest being provided by aerodynamic shapes and surfaces, along with engine thrust. The result should be something with the efficiency of a lighter-than-air craft but with the stability and maneuverability of heavier-than-air craft. The airship also uses an active ballast system that allows for minimal or no ground support for takeoff and landing, making it capable of use even in the roughest, most unimproved terrain. 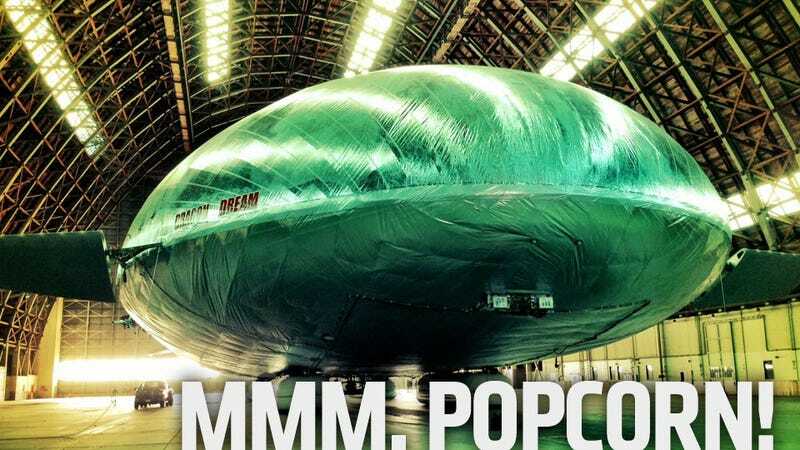 The planned full-sized production version of the airship (this prototype is 1/2 scale) will be capable of carrying up to 66 tons of cargo, have a 140 mph top speed, and a ceiling of 18,000 feet. Of course, the military has all kinds of uses in mind, from plopping tanks down into snooty ballrooms full of the evil cabal of supervillians to bringing aid relief and supplies to remote areas. Really rich people are interested as well, since these could finally become the sky-cruise ships with the glass-bottomed dance floors that rich people probably dream about.